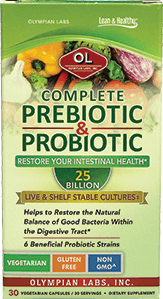 Prebiotics provide food for our microbiota, the microbes naturally living in our gastrointestinal system. By providing support to the friendly microbes in the digestive tract, prebiotics have the potential to provide many health benefits. ** The word ‘prebiotic’ is seldom used on the label. Instead, look in the ingredients list for Inulin, Chicory fiber, or Fructo-oligosaccharides just to name a few. Colony Forming Units (CFUs) is a measurement that estimates the number of live, active microbes in a probiotic product. Each viable microbe has the ability to multiply and form a colony of duplicate microbes. The number of colonies formed is counted and used to calculate the total number of live active microbes. Some experts recommend taking at least 1 billion CFU per day for everyday support. 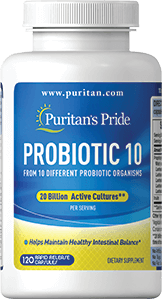 High CFU count probiotic products are also very popular among consumers and are offered by Puritan’s Pride. Daily support for any lifestyle. Trusted formulas for added support. Support comes in many forms. Specially formulated for dietary needs. The acidophilus species includes strains commonly consumed as probiotics, like La-14. Acidophilus is naturally found within the intestinal tract. Found in the bifidobacteria genus is the strain Bi-07. Bifidobacteria are naturally present in the healthy human digestive system. A source of soluble fiber and a healthy addition to your diet. The perfect "after meal" supplement. Contains the enzyme papain. Let’s take a look at three reasons why probiotics are beneficial in your daily supplement routine. While probiotics may seem like a new health trend, their discovery goes back to the early 20th century.